¼ tsp baking soda – DO NOT USE TOO MUCH! It will taste like soap. 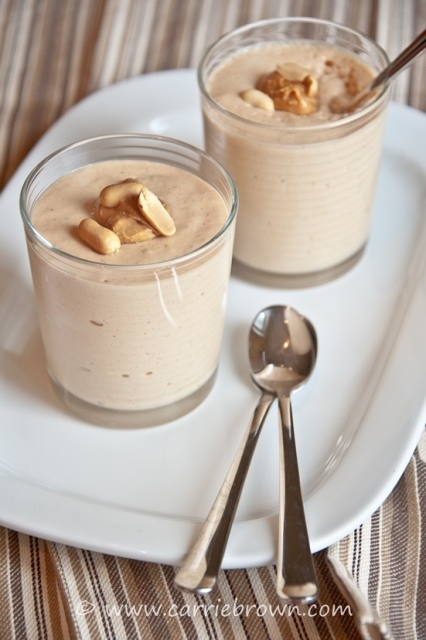 In a large bowl beat together the yogurt and peanut butter until completely blended. Mix in the whey powder, baking soda and salt. Add ½ the xylitol and whisk well. Add the remaining xylitol and whisk until the egg whites are stiff and glossy. Gently fold the egg whites into the peanut butter mixture until completely blended. Spoon into dishes and chill in the ‘fridge. To make this recipe more SANE, try experimenting with a SANEr alternative to peanut butter. The same method would work really well with almond butter, cashew butter, or how about hazelnut butter with a bit of cocoa powder? You could also puree some berries and use an equivalent volume to make a berry mousse. The possibilities are endless! > SANE Peanut Butter Pie. Go Ahead. Eat Dessert First.